"An apple a day keeps a doctor away". This is what the old English proverb says and the situation is really like that. There are different sorts of apples: red, yellow and green. Some of them are sweeter and the others are more flowery. You can choose any sort of apples and all of them will be useful for sure. Most people prefer sweet red apples and do not even look at the green ones. And it is their loss! Due to the nutrients, fiber, vitamins and minerals contained in them they are very useful for maintaining beauty and health. So let us make clear what exactly apples can do for our body. 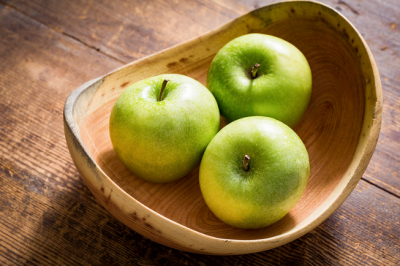 Green apples are rich in fiber which helps to speed up the metabolic processes in the body. If you are sure about the quality of these fruits do not get rid of the peel since it plays an important role either. Apples contain a lot of fibers that protect your liver and digestive system from harmful elements. So if your body needs detoxification eat more green apples. They also help to maintain good blood flow in the body. Proper blood circulation can prevent various diseases of the cardiovascular system including strokes. Green apples are rich in vitamin K and it will help you to get rid of blood clots. This sort of apples is an excellent source of vitamin C which protects skin cells from damage by free radicals, and as a result, reduces the risk of developing skin cancer. And thanks to vitamin A these fruits will help to maintain normal faculty of vision. Everybody knows that apples contain a lot of iron. But not everyone is aware of the fact that they are also rich in calcium. That is why they help to make your bones and teeth stronger. These "green friends" will be useful for those people who want to prolong their youth, to slow the aging process and to make the skin supple. Fine grate a green apple and you will get an excellent vitamin mask. Due to fruit acids contained in it a soft peeling will be provided to your face. And if you want to get rid of dark circles under your eyes just put sliced apples on them for a while. and early spring when our body most often experiences stress. If you want to stay beautiful and healthy, do not forget about apples, especially the green ones.